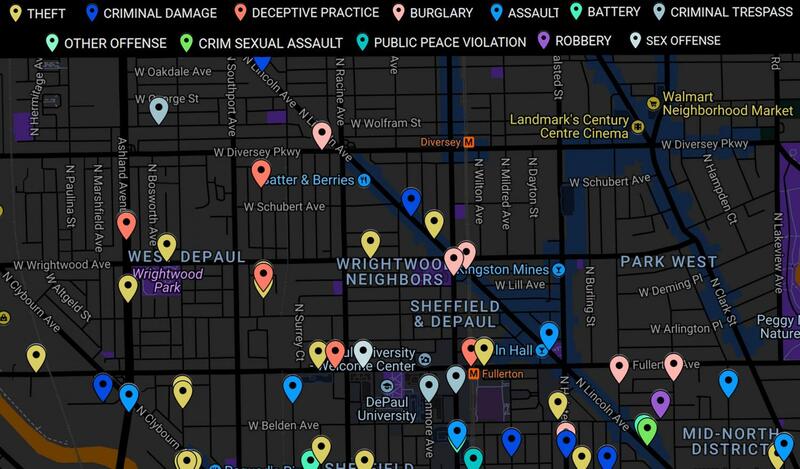 Crimes committed on and near the DePaul Lincoln Park campus from March 30 - April 16, from data obtained via Chicago Open Data Portal. Multiple students were shot and killed in an shooting Friday morning at Santa Fe High School in Santa Fe, Texas, according to police. This mass shooting comes almost a month to the day after a mass shooting in a Nashville Waffle House left four people dead. Only six months into the year, there have been over 20,000 incidents involving guns, 100 of which were mass shootings, according to the Gun Violence Archive. The presence of gun violence has become a harrowing new reality for Americans and as a result, there has also been an increase in concerns regarding safety and emergency protocols in places where these shootings are most likely to occur. Consequently, safety concerns are growing among students and faculty at DePaul as the frequency of mass shootings increases nationwide. 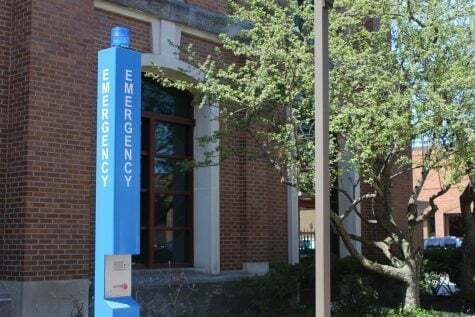 Blue emergency boxes, like the one pictured above, can be found throughout campus. DePaul would not provide information on response times. And now the effectiveness of Public Safety is being questioned as a 21-year-old woman was stabbed in the face and neck on Webster Avenue on Tuesday, April 10. With all of these constant threats looming over DePaul students and staff, some members of the community have begun to question the steps that DePaul is taking to protect students. There has been increased concern surrounding the safety of students on and around both campuses. Most notably, the “Parents @ DePaul” Facebook group has seen an increase in posts regarding safety since 2016, with another spike around January of this year. The page functions as a forum for parents with students on campus to communicate and exchange ideas. Recently, much of the conversation has turned to crimes occurring on campus and ways students can be protected. With frequent Public Safety alerts being sent about attempted muggings and assaults on campus, many students can’t help but feel as though Lincoln Park is becoming more dangerous. DePaul’s Public Safety Department is specifically tasked with preventing and handling crime on campus. According to Public Safety Director Robert Wachowski, the department “works closely with and relies on assistance from the Chicago Police Department” and has clear goals in place regarding campus safety. But for many at DePaul, it feels as though these goals are not being achieved. Faculty and staff are also becoming more aware of the potential dangers on campus and the potential challenges the university faces in combating these threats. Kendra Knight, a professor in the College of Communication, says that safety is a concern that front and center in her mind. The actual daily operations of Public Safety are also coming under scrutiny, as officers are often seen not actively patrolling the campus – or they’re completely unseen at all. “(When I lived on campus) they were always just parked off the Quad and never did anything,” said student Constance Priddy. DePaul has put in place a task force to prevent violence and handle potential threats. That task force, the Student Care Team (SCT), is run by the Dean of Students office and is comprised of experts working together to assess threats to students and the DePaul community at large. “At least every quarter we have something we look at very very seriously,” said Ashley Knight, DePaul’s Title IX coordinator and the chair of the SCT. On March 26 at March for Life, thousands protested in Chicago in support of gun reform following the deadly shooting at Marjory Stoneman Douglas High School in Parkland, Florida. After a long string of deadly mass shootings across the country, concerns about a potential active shooter situation have been growing. 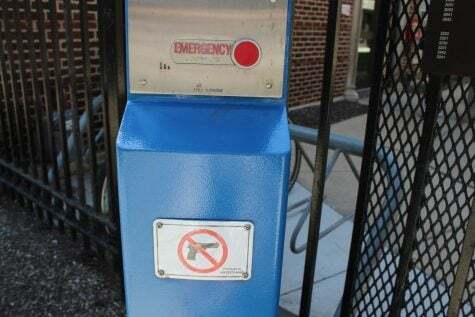 This also comes at a time of great debate surrounding the issue of whether or not school safety officers should be armed; DePaul is one of the only colleges or universities in Illinois without armed safety officers. For many, the mere presence of a gun automatically increases the level of danger, while others argue that the level of safety would be increased so long as the officers are trained. DePaul’s Public Safety officers are the only campus security guards in the state that do not carry weapons. Maria Peterson, the mother of a DePaul freshman, says it’s time for that to change. “I think (arming officers) is needed in this day and age, sadly,” Peterson said. Public Safety has put in place a number of protocols and procedures regarding emergency responses but has failed to adapt the plans to fit the unique needs of the school, among them: an immense amount of glass walls, stairwells lacking cameras and poorly located Public Safety lookout desks. During a university-wide walkthrough of each building conducted by The DePaulia, many structural flaws were discovered that make students and staff more vulnerable to outside threats. Many rooms are enclosed partly or entirely by glass, which makes barricading the door and hiding out of sight – DePaul’s recommended emergency plan for an active shooter situation – entirely pointless. This flaw is present in buildings across both campuses, including in the CDM and Daley building, the Arts & Letters Hall and the Student Center, each of which see thousands of students daily. However, he declined to comment on whether design changes would be considered to make the buildings safer for students and staff. Additionally, the university spent $35,195 in a quantity order on specialized door locks for classrooms across both campuses, according to a Nightlock representative. Despite this,DePaul has failed to verify if faculty and staff were ever properly instructed on how to use the locks; staff were emailed a link to an instructional video, but no further action was taken to follow up. The question of increasing the amount of buildings that require swipe access has also been raised. Nearby Loyola University installed a swipe system in its library after repeated incidents in which people not affiliated with the school were found on the premises. Many Loyola students see the spread of swipe access buildings on the campus, including the library, as a positive improvement. “It makes sure that only students and faculty are able to get in (to the library) and keeps out those random people,” said Sarah Lambi, a student employee at Loyola’s campus safety department. According to Wachowski, expanding swipe access is not the solution for DePaul’s safety woes. “These options aren’t guarantees for crime prevention, and they are not feasible for our open campus,” he said. When asked to compare DePaul’s safety to that of Loyola’s and UIC’s, Wachowski decline to comment. 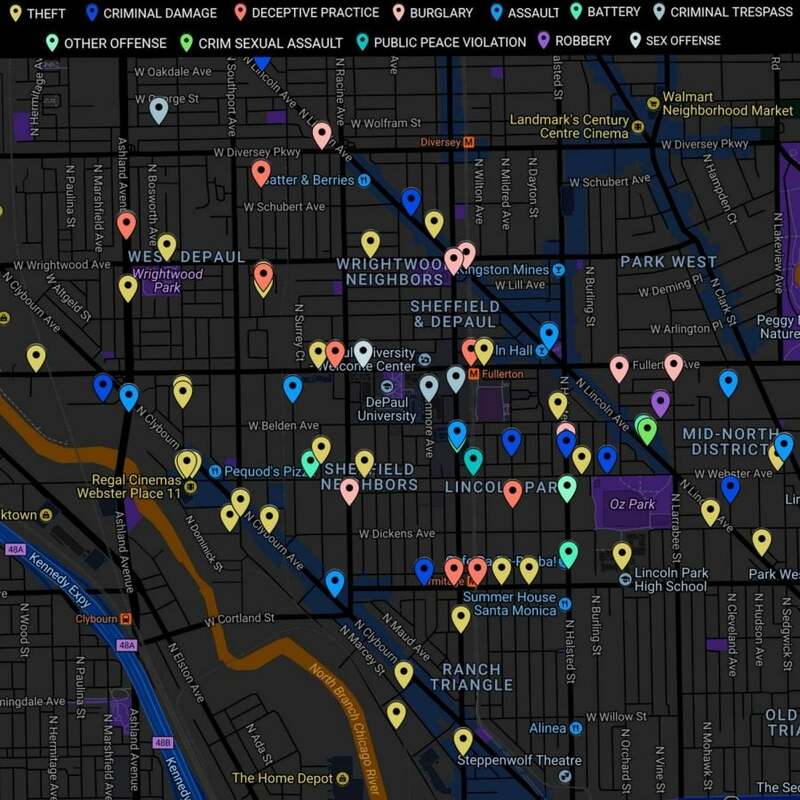 A map of crimes committed on and near the DePaul Lincoln Park campus from March 30 – April 16, from data obtained via Chicago Open Data Portal. Do you have a source for this? If so, it should be noted.